[AUTO](VC):At the beginning of your main phase, Soul Charge (1), and this unit gets [Power]+2000 until end of turn. [AUTO](VC/RC):[Soul Blast (8) & Counter Blast (5)] When this unit’s attack hits, you may pay the cost. 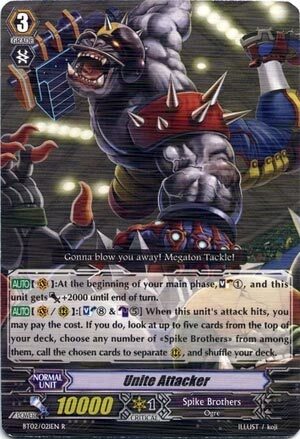 If you do, look at up to five cards from the top of your deck, choose any number of «Spike Brothers» from among them, call the chosen cards to separate (RC), and shuffle your deck. You know, CEO Amaterasu set up something good with her Megablast. We needed more cards like her, where it was entirely optional and she had something to do even before then.